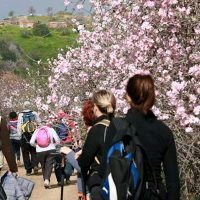 Seeing the Algarve’s fields covered in the stunning white and pink of almond blossoms will be the main attraction of a series of walks that will be held in Cumeada da Alta Mora, Castro Marim in February. The event has become so popular that organisers are hosting two walks this year on Sunday, February 3 and 10. Both begin at 9am near the association’s headquarters, the former Alta Mora primary school.